supplies and health services. Founded with an all-male board and officially endorsed by the Secretary of War, the organization was conceived through the combined efforts of Dr. Elizabeth Blackwell, who had spearheaded the Woman’s Central Association of Relief (WCAR) in New York, Unitarian minister Henry Whitney Bellows of Boston, and social reformer Dorothea Dix. Some local organizers eventually became paid professionals, beginning their first experience in the government workforce. Dix met with considerable resistance from doctors and surgeons, who resented her authority and were skeptical about the imposition of nursing women in army camps and hospitals. And yet at least 3,200 white women eventually served during the Civil War as nurses through the USSC. Field relief corps of the U.S. Sanitary Commission. 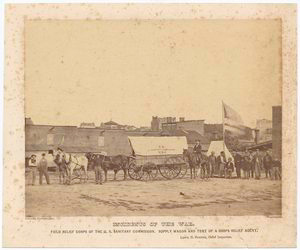 Supply wagon and tent of a corps relief agent. Lewis H. Steiner, Chief inspector. Courtesy New York Public Library.